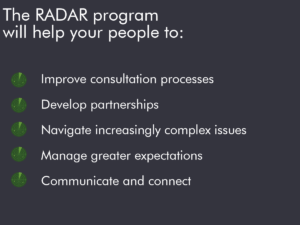 When you’re part of the RADAR program, you’ll have unprecedented access to a professional team whose members each have over 20 years’ experience in group facilitation and stakeholder engagement. The in-house professional development workshops have been developed and delivered by us as industry professionals, based on our hands on experience in building, utilising and adapting these skills throughout our careers in government and the private sector. 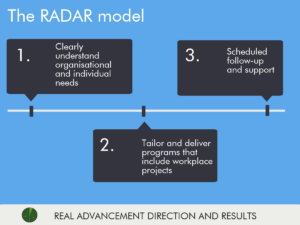 We are continually using these skills and constantly looking for options to improve – meaning your staff will get the direct benefit of our practical experience and ongoing learning. 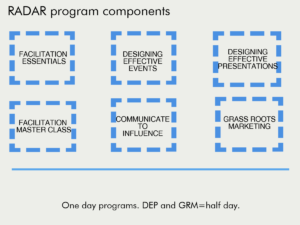 The RADAR program consists of an integrated package consisting of practically focused workshops that will directly address the identified needs of participants long after the final workshop is completed. Planned to include scheduled follow-up processes to embed learning. Let’s be clear from the start – this won’t be a series of day-long Power-point presentations. Within each program, the action learning cycle will be utilised, to help participants to better understand the ‘So what’ implications what it means in their world. You know as well as we do that maintaining the skills of your staff is vital for the health of your organisation. 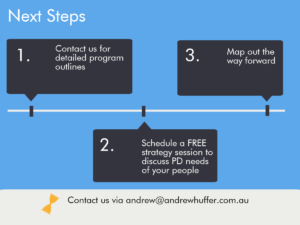 Schedule a strategy session today with Andrew to discuss how we can work together!